Pit Boss is a Bowser minigame from Mario Party 6. In real life, a pit boss is a person who supervises all the other employees in a casino. The game starts with all players in a pit. 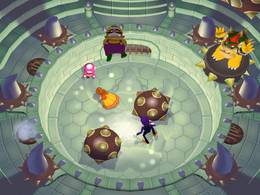 Suddenly, Bowser appears and throws a large Spiked Ball into it, which players have to avoid. If hit, players reappear in a cage on the sidelines and become one of the losers. Eventually, the ball loses speed and stops. Bowser, infuriated, throws two more Spiked Balls into the pit. These new balls hit the first and cause it to start rolling again, and gameplay continues as before. Whoever survives until time runs out is the winner. Rules – "Dodge Bowser's rolling spike spheres!" Advice – "Bowser will throw three spike spheres into the arena. Avoid them as long as you can to win!" This page was last edited on January 19, 2018, at 14:06.